SOUTHERN UTAH — Fruit trees can weather wet soil, winter cold, seasonal freezes and a myriad of bacteria and pathogens in Utah, but three diseases are particularly serious; if left untreated they can be lethal. Many diseases don’t have to be a death sentence for trees if they are stopped in time. Trees have natural defenses that help sustain and protect them, degreed arborist Mark Hodges, owner of Arbor Tech in St. George, said. Arborist Mark Hodges demonstrates pruning techniques to stave off common tree-killing diseases. St. George, Utah, Jan. 4, 2017 | Photo by Cody Blowers, St. George News | See the full video top of this report. The bark of a tree is its first line of defense, and serves as a protective barrier against bacteria and other organisms that can kill a tree, Hodges said. Much like skin on the human body, any cuts or injuries in the skin allow bacteria to enter, making the body vulnerable to infection. In much the same way, improper pruning methods create cuts or breaks in a tree’s bark that can allow bacteria and viruses to wreak havoc on a tree internally. The infection can then spread to other parts very quickly. Cross-contamination can also spread disease by transferring bacteria from one area of a tree to another, Hodges said, or from one tree to another. 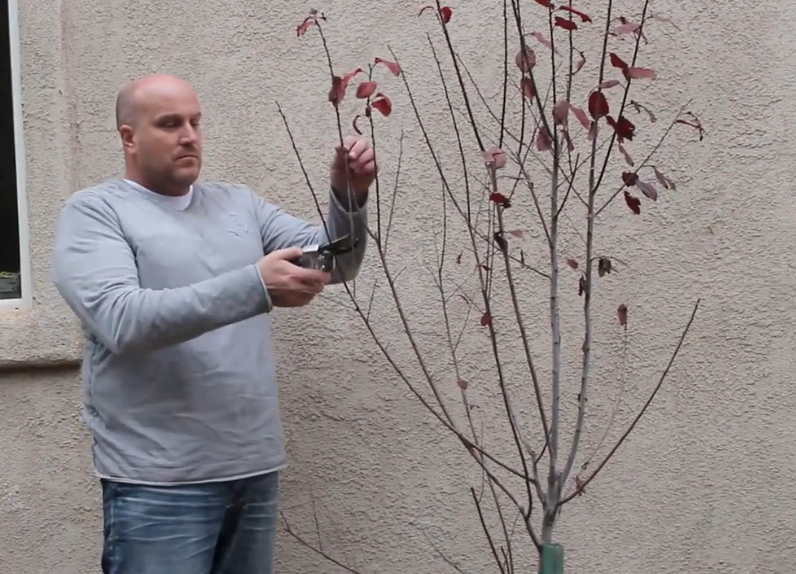 See Hodges’ pruning demonstration in the media player top of this report. Certain bacteria, fungi and organisms target specific types of fruit trees, including apple, pear, plum and cherry. These conditions are serious, and some can wipe out an entire orchard in one growing season. Three such diseases are phytophthora root rot, sooty canker, and fire blight. The Latin name for these fungus-like organisms, phytophthora, means “plant destroyer.” Phytophthora is a pathogen, a disease-causing microorganism that is naturally present in soil. Under the right conditions these organisms can cause root rot. While many pathogens can cause root rot, phytophthora root rot is one of the deadliest and can destroy almost any fruit tree. This condition usually infects plants that are growing in poorly drained soils or where overwatering is present. Once the roots are infected, the disease develops and kills the tree gradually. 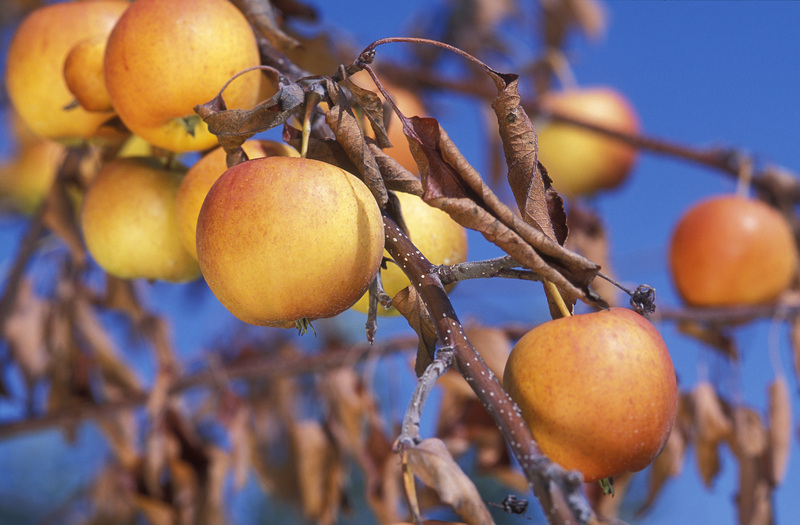 In Utah, root rot attacks stone-fruit trees, which include peach, plum, nectarine, apricot and cherry. Root rot advances well in a warm, humid climate. The disease can spread to the stem, flower, shoots and fruit, and is most destructive on maturing fruit just before harvest, forensic biologist Claudia Nischwitz wrote in a 2016 publication by Utah State University Extension. Trees may also appear healthy in the spring but die suddenly in the latter part of the growing season. If infected with root rot, the tree will have wilted, brown and wrinkled blossoms that do not progress into fruit. If the stems are damaged then brown spots or spores can appear on the fruit, which becomes rock hard and inedible. This disease is difficult to control and once infection is discovered, it is usually too late to treat. That said, removing the soil at the base of an infected tree, exposing the infected area and then letting it dry will prevent further infection. Reducing the amount and frequency of irrigation also helps to treat and prevent the disease, Hodges said. Sooty canker is caused by a fungus that attacks many different plants but seems to favor apple, poplar and cottonwood trees. It is also particularly devastating to the mulberry tree population in the St. George area. The condition causes cankers and wilting that results in dieback – a progressive death that starts from the tips and works its way down. The fungus enters the plant mainly through wounds and cracks in the bark but can also enter through pruning wounds, frost damage and injuries from insects and other diseases. Sooty canker spreads from infected to healthy trees through spores carried by wind, rain, insects, birds and infected pruning tools. This disease can be controlled if the infection is confined to tree limbs and upper portions of main branches, which can be removed. “If it spreads into the trunk of the tree then it’s over,” Hodges said. Sooty canker can be prevented by keeping trees healthy, using careful pruning techniques and avoiding unnecessary pruning, Hodges said, since the bark is the most common point of entry for the bacteria. One of the most deadly diseases that attacks pear and apple trees is fire blight, a disease caused by a bacteria. 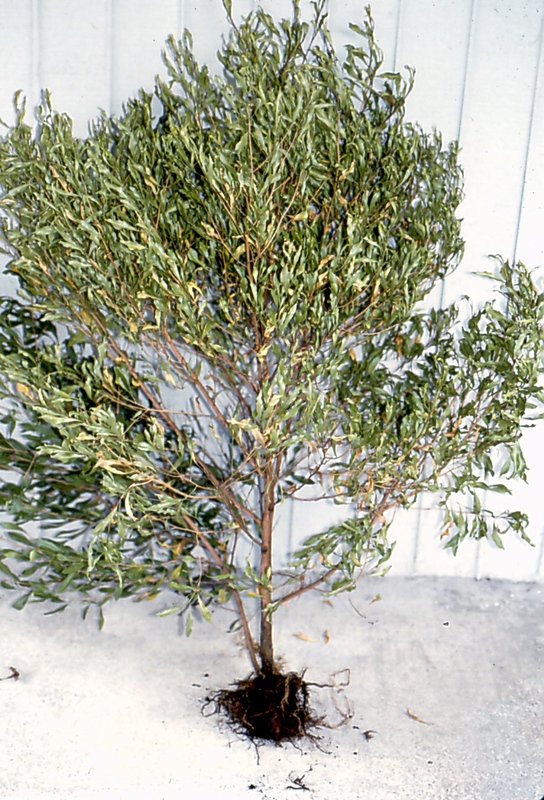 Under the right conditions, it can destroy an entire orchard in a single growing season. Named for the scorched appearance of infected leaves, bacteria enters the tree at the tips of the branches and then travels down the stems, killing the tree as it spreads. “The bark actually peels back, showing a black or sooty appearance,” Hodges said. There is no cure for the disease, he said, and while damage confined to the smaller branches can be pruned out, severely damaged trees have to be completely removed. Fire blight spreads through rain or water splashing on the tree and by insects, birds, other infected plants, the arborist said. Trees are most at risk of exposure as they emerge from dormancy in spring and begin to blossom. Death from fire blight most frequently occurs in summer, as extreme heat puts a severe strain on the already weakened tree. Prevention is the key to managing disease and can help protect healthy trees from becoming infected, Hodges said, by stopping the spread of bacteria and other dangerous organisms that can kill them. 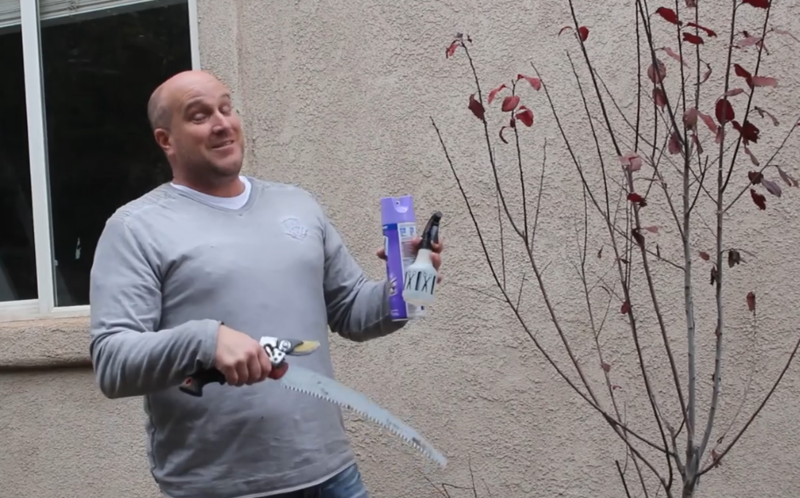 Arborist Mark Hodges demonstrates disinfecting techniques to defeat cross-contamination of bacteria and other diseases when pruning trees. St. George, Utah, Jan. 4, 2017 | Photo by Cody Blowers, St. George News | See the full video demonstration top of this report. Disinfecting pruning tools on a regular basis, and particularly when working in areas where viruses, fungi or bacteria are present, is critical to prevent cross-contamination. Hodges recommends using either Lysol or a solution of 1 part bleach to 10 parts water to spray disinfect pruning sheers and other gardening tools. Using a copper spray is effective against a number of diseases that attack fruit trees, Hodges said, including fire blight, bacterial canker and fungal diseases on apple, pear, cherry, peach and plum trees including ornamental plums. Allow two weeks between applications while using any sprays containing sulfur. The key is to spray as often as possible while disease conditions persist. Also, starting early is more effective than waiting until spring when temperatures rise and dangerous bacteria and fungus become active. Hodges won an entrepreneurial contest at Dixie High School in his youth and was awarded $3,000 for running his own professional tree service. That tree service is ongoing today. As his business developed, Hodges went on to work for the City of St. George as the city forester, obtained his degree in arboriculture (the study of trees) from then Dixie College, continued his personal career and expertise obtaining the title of master gardener, receiving his UNLA certification (certified nursery man, he said) and so it goes. He has taught classes and seminars on plants and things of this nature. Hodges has also served on the Shade Tree Board for the City of St. George, among other things.